Sometimes laundry is not about just water and detergent for clean clothes. Although the detergent advertisement did say pesky stain busting detergent, common, we all know the truth. The hardest and most stubborn stains in the world to remove are wine, turmeric, motor oil, ink, banana and dye. Tough stains call for some serious laundry action. The earlier you work on ways to remove dirty and stubborn stains from clothes the better. Pretreating your stains is a sure shot way to removing it, but better late than never. With all those detergent/soap/liquid advertisements in the market promising to fight their best, it can get confusing. To help you out, we came up with Foolproof Ways to Remove Dirty and Stubborn Stains from Clothes. Get amazed by these amazing way to organize your kid’s stuff. How Do You Remove Stains From Clothes At Home? Don’t let a stain ruin your favourite piece of clothing. Even the most troublesome stains can be removed at home without sacrificing your cloth quality. These are some ways to remove dirty and stubborn stains from clothes at home. Before you begin treating the stain, pre-soak the clothing material in cold water and do not rub the stain. We made removing easy, just the way we made detaching old wallpaper easy and effortless. How To Select The Fabric for Stain Removal? Different cloth material determines what type of solvent is needed to remove the stains. Some detergents are too harsh and can damage the clothing material. Furnish your living room decor in the smartest way possible. Removing Stains From Wool – Woolen clothes are susceptible to stretching and deformity, hence bleach and acid can ruin the wool. There is a special detergent for woollen clothes. Removing Stains From Synthetic – Synthetic fabric is easy to work. Any standard laundry detergent can fight the stains. How To Get Every Type Of Stain Out? Let us meet some toughest stains and learn ways to remove dirty and stubborn stains from clothes. Remove the stains and make your clothes smell fresh just like your home. Wine Stains – The last thing you want is spilling wine on your favourite clothing. Drinks only look nice when they’re in your hand. Wine stains should be treated as fresh as possible. For a quick solution, sprinkle some salt and gently dab with a cloth to absorb the stain. As soon as possible, soak it in warm water after applying a thick layer of salt or baking soda. Tea/ Coffee Stains – As long as you’ve spilt hot tea on yourself, you’re fine. For removing dye stains, soak in cold water for 30 minutes and wash the clothes in the hottest setting of your washing machine. Ink Stains – Ink surely doesn’t understand the difference between paper and clothes. Soak the cloth for 30 minutes in cold water with some ammonia and gently rub the stain. Rubbing alcohol can also help remove the stubborn ink. Oil Stains – Motor oil or cooking oil can be considered as top nightmare laundry task. They are so sticky and stubborn. Oil stains contain carbon, which breaks down and deposit black material on your clothing. Apply some white chalk, talc over the oil stain, to absorb and avoid the black deposit. Grease Stains – Oiling an engine can get messy and dirty leaving stubborn stains on clothes. Apply some cornstarch and rub the stain to soak up the grease stains. Let it sit for 30 minutes and dust it off. Follow the normal washing procedure with alkaline stain removal solution. Collar Stains – The prominent type of stain is collar stains. The oil and dirt stain turn black or brown when comes in contact with the air. Wash the collar with some shampoo and rub it softly, this is the best way to remove dirty and stubborn stains from clothes. Blood Stains – Let’s face it, ladies, we know the struggle behind removing the blood stain. But did you know a little amount of hydrogen peroxide can make our task easy? 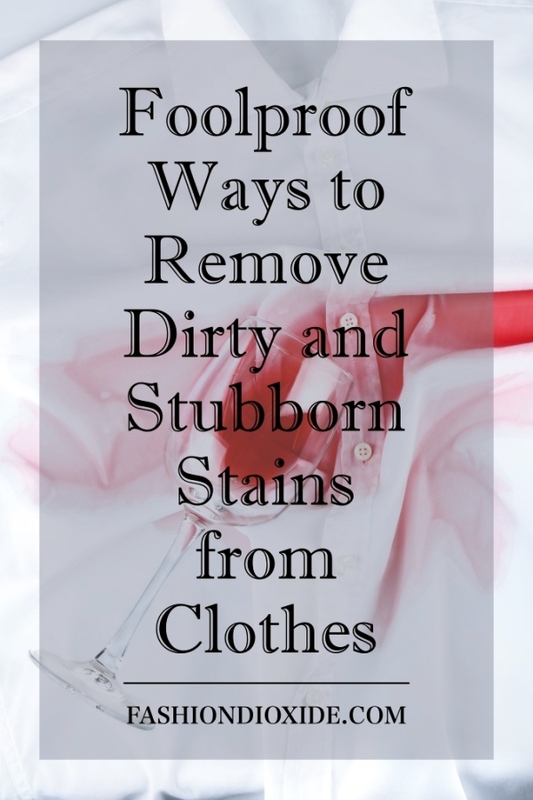 These were the foolproof ways to remove dirty and stubborn stains from clothes. After washing the stain, make sure to check if the stain has gone. If not, repeat the same procedure of pretreating and washing the stain. Save your cute little succulent from dying with these 3 smart steps.